Some see Stephen Colbert playing the part of a right-wing talk show host and assume that he is mocking them. Others listen carefully to what he says and find that he actually makes some important right-wing talking points every so often. These are usually put forth somewhat humorously and people often laugh, but they still make sense and I can think of no reason why they wouldn’t help to change someone’s mind. Both sides like him. How is this possible? One of the concerns I hear from the left is that the rich use their wealth to buy advertising or donate to campaigns to wield disproportionate influence over elections. Forms of regulating speech and money are proposed to mitigate this problem. In response, the right claims that “sunlight is the best disinfectant,” meaning that rather than regulating speech and money and forcing it underground, it is best to make donations and expenditures public knowledge so that the voters can see them and make up their own minds. With the recent ability for corporations to legally spend unlimited amounts on political advertising, Colbert quips in this video that some worry about corporations secretly buying democracy, but rather they are publicly buying it. Buried right inside his expression of the concerns of the left he plants a seed of thought that the donations are public knowledge, giving voters the ability to judge candidates based on who supports them (and who they may feel obligated to return the favor), and thus repeats a right-wing talking point. Are these points lost on people? Is there any way for the right to reach the left (and vise versa)? Rather than making things easier to swallow and accept, is the use of humor actually counterproductive? I used to think that I at least understood my own culture, if not necessarily others, and I have always used humor to communicate in my everyday life, but it seems that in the world of politics, many people live in bizzaro-world and might misunderstand me. 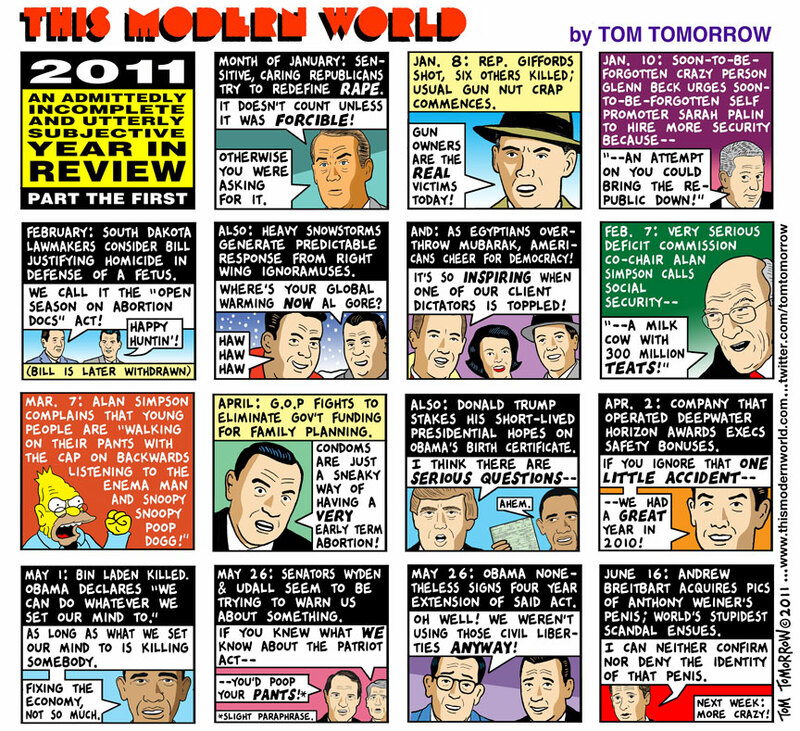 This Modern World is a comic strip written by Tom Tomorrow. Half the time I read it, it seems to be supporting an anti-Republican agenda. The other half of the time, I find it so ridiculously exaggerated and over the top that I have to wonder if it is actually being used to mock Democrats. Often, what it accuses Republicans of doing is exactly the same thing that I have actually seen Democrats doing. I don’t know how others view it. In this strip, he illustrates a phenomenon (among many) of right-wingers mocking global-warming-believers every time it snows. This is not the only place I have heard this accusation. The right has been accused of cherry-picking anecdotal evidence of record-breaking cold temperatures not at all representative of the whole world nor of the year they take place in and use them to call into question the theory of global warming. The strange thing is, until recently (the last five years or so), it was the right accusing the left of cherry-picking anecdotal evidence of record-breaking hot temperatures to support the theory of global warming. So, when I see a strip such as this one, my first instinct is to assume it is mocking Democrats by turning their own arguments against them. Another phenomenon he illustrates in the strip is the existence of the gun nuts, but by including them, doesn't it just remind everybody of the anti-gun nuts that the gun nuts react to? It does me. In fact, if there were no anti-gun nuts first, there would be no gun nuts to react to them. Again, it seems to be an extreme form of satire of arguments that Democrats have actually used. Is Tom pushing a right-wing agenda? Tell me what you think. Is Colbert a secret Republican or a secret Democrat? How do you interpret This Modern World? Given our propensity to misunderstand even casual humor, is there any hope for us ever to understand each other? Might those candidates who come across as the worst actually be on our side?